How important is collaboration to quality research? There are many fine mineral processing research institutes around the world. MEI has very close involvement with two of them, Australia's JKMRC and South Africa's University of Cape Town. Research teams at both of these have very strong collaborative ties with each other, mainly due to the efforts of Profs. Malcolm Powell and Dee Bradshaw at the JKMRC, and Prof. J-P Franzidis and Dr. Aubrey Mainza at UCT, all MEI consultants. One lesser known university has impressed me with its work in recent years. Turkey has many universities with mineral processing research departments, of varying quality, but that of the Hacettepe University has evolved into one of very high quality. Maybe because it has strong collaborative links with various high calibre institutes such as the JKMRC. The flotation team at Hacettepe is led by Dr. Zafir Ekmekci, whose work led me to invite him to represent Turkey on the editorial board of Minerals Engineering. At the recent Flotation '11 conference, he and co-workers presented four papers, two in collaboration with other establishments. Prof. Hakan Benzer leads the strong comminution team. He recently presented the plenary lecture, on HPGR technology, at the Lulea Conference on Minerals Engineering in Sweden. He and his team have four papers scheduled for presentation at Comminution '12, together with co-workers from UCT, JKMRC, Chalmers Rock Processing Research, Sweden, the University of Rio de Janeiro, and the German company NETZSCH-Feinmahltechnik. So how important do you think collaboration is, and what tips can you give emerging research institutes on how to go about seeking such links? Only 3 more weeks now to the start of Comminution '12 in Cape Town. This series of conferences really became established in 2008 in Falmouth, with an attendance of 157 delegates, severely stretching the facilities at the Falmouth Beach Hotel, which was the main reason for transferring the conference to the Vineyard Hotel in Cape town in 2010. Currently over 210 delegates are already registered for next month's event. 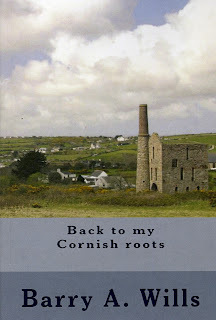 We had very diverse weather conditions in 2008, warm and sunny for the coastal path walk, and very wet for the conference dinner and the visit to the Camborne-Redruth mining area. A few photos from Comminution '08 are shown below. 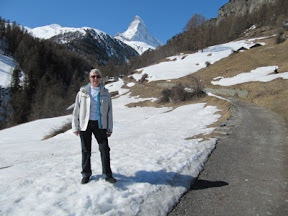 I'm back in the office now after my week in Zermatt (postings of 21st and 23rd March), and there have been some developments in forthcoming MEI Conferences during my absence. The world's biggest gold producer, Barrick Gold Corporation, has agreed to sponsor Precious Metals '12 in Cape Town, joining Newmont Mining Corporation and Implats as major sponsors. The number of delegates registered for next month's Comminution '12 passed 200 a few days ago, making this, the 8th International Comminution Symposium, the biggest in the series. FLSmidth is a major sponsor for Comminution '12 and for next year's Flotation '13, and has also just agreed to sponsor Physical Separation '13 and Biohydrometallurgy '12, both of which will be held in Falmouth. Registrations for Biohydrometallurgy are looking good. FLSmidth is sending a number of people, including Gaudin Gold Medallist Phil Thompson. Nine members of the strong biohydromet team at Central South University, China will also be represented at the conference. 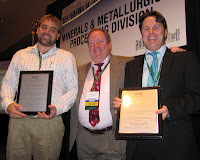 Some more good news is that MEI's Minerals Engineers group now exceeds 2500 members. This is our last day in Zermatt. Tomorrow we leave the village at 3.50am for the 12 hour journey back to Falmouth by coach, airplane and car! The last few days have been warm and sunny, so due to the deteriorating snow conditions, we returned the skis yesterday, and have spent the last couple of days exploring a few of the many summer hiking trails in the mountains, all with magnificent scenery. The photo below is taken at Gornergrat (3089m) looking down on the series of glaciers from Switzerland's highest peak, the Monte Rosa at 4634m (above Barbara's head). 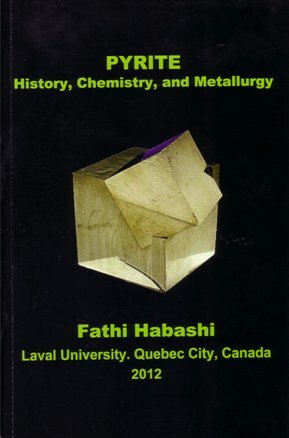 Two new books from one of the mineral processing industry’s most prolific authors, Fathi Habashi, Emeritus Professor at Laval University, Canada, were published in January this year. 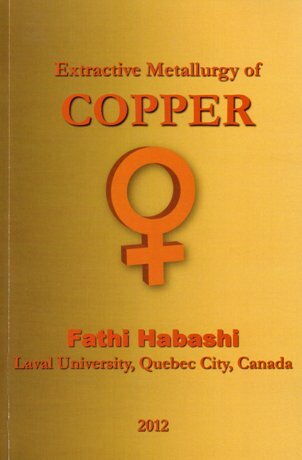 Extractive Metallurgy of Copper covers the chemistry, history, pyro-, hydro-, and electrometallurgy of copper. Kinetics of leaching of copper ores and a literature guide are also included. Pyrite. History, Chemistry, and Metallurgy covers the history of pyrite - how it was a strategic mineral necessary for the production of elemental sulfur needed for making gunpowder for military purposes and for the production of SO2 needed for making sulphuric acid for the chemical industry. Now its presence is a nuisance in tailings ponds. The book also covers the processing of pyrite containing gold, its chemistry and technology, the processing of pyrite cinder for the production of a variety of metals, and its behaviour towards autotrophic microorganisms. Both books are distributed by Laval University Bookstore. 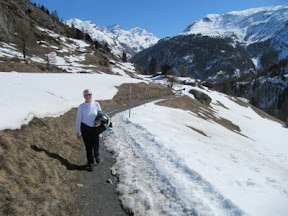 Barbara and I are skiing this week in the highest mountain area of Switzerland, the Pennine Alps. We are staying in the town of Zermatt, which is almost surrounded by the high mountains, and is dominated by one of the world's most famous mountains, the Matterhorn. The Matterhorn lies on the border between Switzerland and Italy. Its summit is 4,478 metres (14,690 ft) high, and it is a little scary just to look at, with its four steep faces, facing the four compass points, making it one of the deadliest peaks in the Alps. It was one of the last great Alpine peaks to be climbed, by a party led by Edward Whymper in 1865 and ended disastrously when four of its members fell to their deaths on the descent. The north face was not climbed until 1931, and is amongst the six great north faces of the Alps. From 1865 – when it was first climbed – to 1995, 500 alpinists have died on it. What is less well known, however, is that its upper portion is actually a part of ‘Africa’, thrust bodily northwards over Europe during the Alpine oregeny. The formation of the Matterhorn (and the whole Alpine range) started with the break-up of the Pangaea continent 200 million years ago into Laurasia (containing Europe) and Gondwana (containing Africa). While the rocks constituting the nearby Monte Rosa, Switzerland's highest mountain, remained in Laurasia, the rocks constituting the Matterhorn found themselves in Gondwana, separated by the newly formed Tethys Ocean. 100 million years ago the extension of the Tethys Ocean stopped and the Apulian plate broke from Gondwana and moved toward the European continent. This resulted in the closure of the western Tethys by subduction under the Apulian plate. The Alpine orogeny itself began after the end of the oceanic subduction when the European continental crust collided with the Apulian continent. The African plate bulldozed its way inexorably into Europe, the relentless forces forming a series of nappes, folds sheared so much that they fold back over on themselves and break apart, which is why Alpine geology is so complex. The fact that the nappes allowed relatively older rocks to be folded over younger rocks perplexed geologists for decades. The Matterhorn acquired its characteristic pyramidal shape, which presented such formidable challenges to Whymper et al, in much more recent times, by natural glacial erosion over the past million years. It is certainly an imposing sight, presenting a dramatic backcloth to all who walk and ski in this wonderful area. I know that many of our blog readers come over to Europe to ski, so my views may be of use to you. 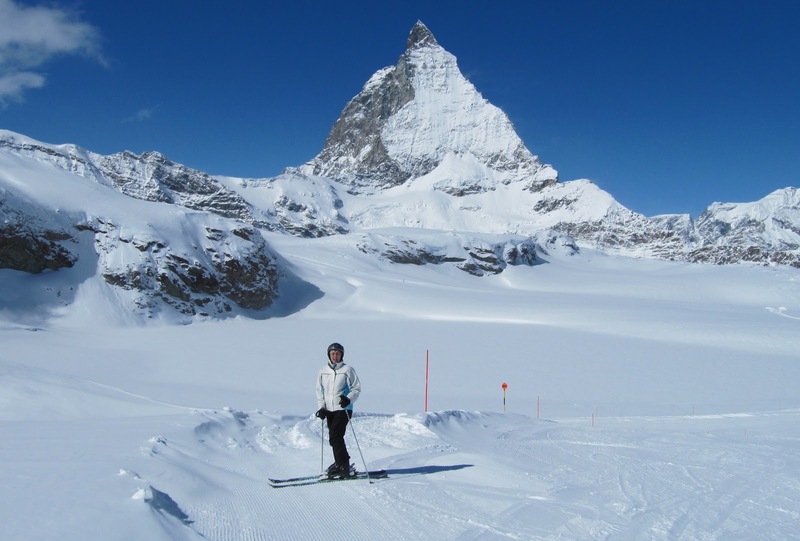 Zermatt is probably the most beautiful area that we have skied in. It is also one of the most expensive. 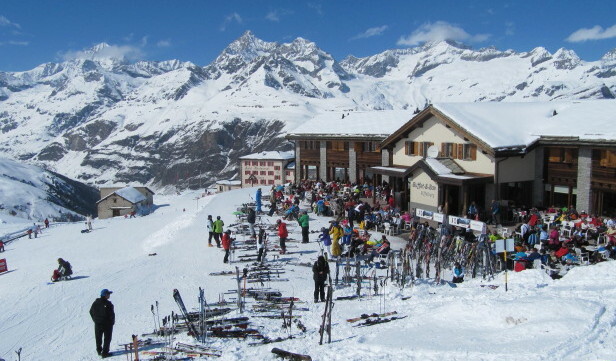 The restaurants in town are good but expensive, and the ski passes are some of the most expensive in Europe, but this pays for the excellent lift system and maintenance of the slopes. 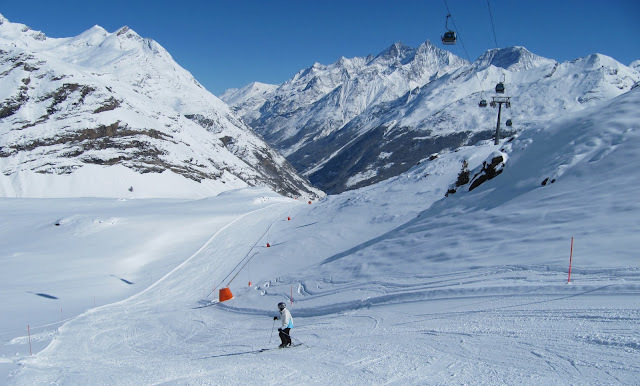 These are great for intermediate-advanced skiers, but probably a bit demanding for beginners, who may prefer the long 'blues' of nearby Saas Fee. 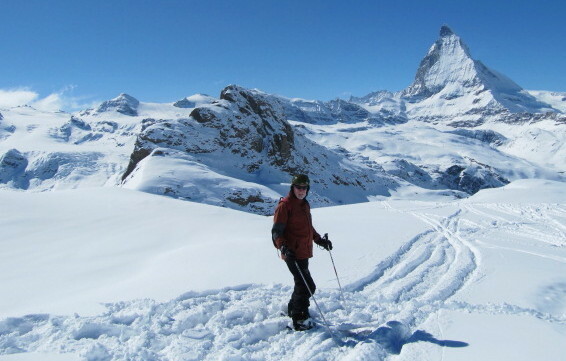 Zermatt's runs are mainly graded 'red' and are very long, one being over 8 miles into the village. There are few easy 'blues' and also few 'blacks' which may discourage advanced skiers. Electronic publishing with ScienceDirect is rapidly evolving, and Elsevier would like to know if there any software tools that either you or your colleagues regularly use for analysis/model building or visualisation. They are looking to see how such tools might be linked to ScienceDirect through the development of the “article of the future", which is explained in a video on YouTube. If you have any views or suggestions, we would appreciate your comments here. In just over 4 weeks time Comminution '12 commences in Cape Town. With a record turnout of well over 200 delegates, this will be the largest in the series of International Comminution Symposia, the first being held in Camborne in 1989. 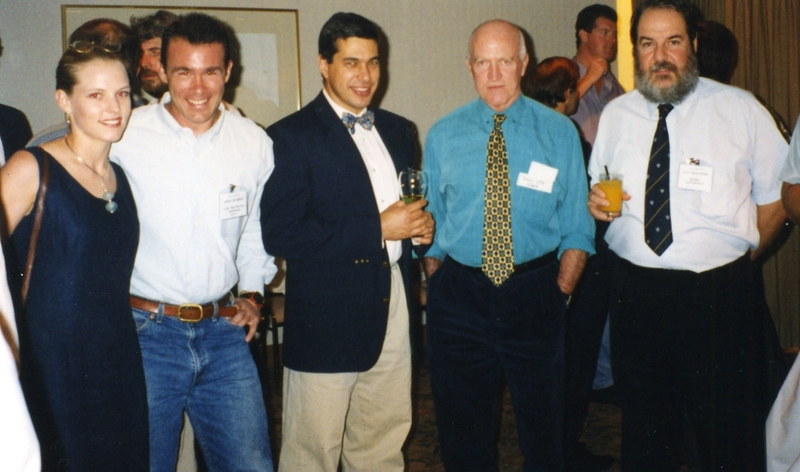 There was then a 9 year gap until the 2nd conference, held at the Sheraton Hotel, Brisbane in 1998. There will be a few familiar faces in these photos. 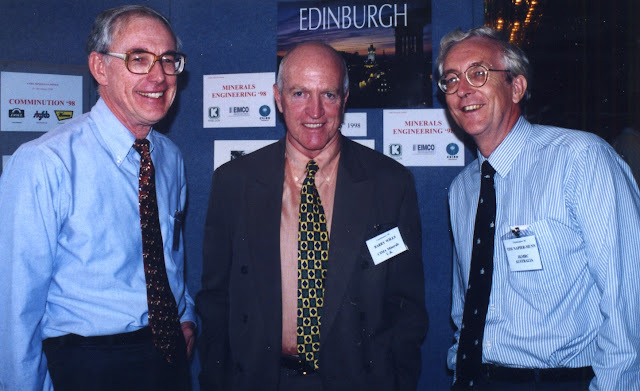 Below I am with John Mosher and friend (far left), John at that time being with Hazen Research, USA. Jannie van Deventer was then at the University of Stellenbosch, South Africa, and is now with the University of Melbourne. Far right is J.-P. Franzidis of the University of Cape Town, now one of MEI's consultants to Flotation '13. Below I am with the late Peter King, then with the University of Utah, and Tim Napier-Munn, who was then Director of Australia's JKMRC. Unfortunately these photos are all that we have in the archives, so it would be great to hear from anyone who has memories of this event. 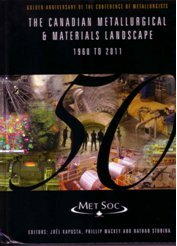 The Canadian Metallurgical & Materials Landscape 1960 to 2011 is edited by Joël Kapusta, Phillip Mackey and Nathan Stubina, and published by the Metallurgy and Materials Society of the Canadian Institute of Mining, Metallurgy, and Petroleum, (ISBN: 978-1-926872-08-7). The book is subtitled “Golden Anniversary of the Conference of Metallurgists” (see also posting of 7 October 2011), and covers the fifty years organizing the Conference of Metallurgists in Canada and is dedicated to all those who toiled and helped build the Canadian mining, metallurgical, and materials industry into what it is today, and to all those who contributed to the growth of the Conference of Metallurgists over its first fifty years. This section is in 4 papers. The first covers history of the conferences and the vast number of books and proceedings volumes generated from these conferences and who contributed to this effort. The article concludes that The Society is continuously improving its structure to better serve its members. When celebrating an anniversary one should look back to gain insight into the future. One of the gods honoured by the Romans was Janus for whom the month of January is named. He is represented by a head with two faces, one looking at the past and the other looking to the future. The second paper discusses Canada’s mining industry and recent social, economic and business trends. This is then followed by a paper discussing metallurgical/materials engineering education in Canada. The last paper in this section discussed the important role of Canada Centre for Mineral and Energy Technology, known by the acronym CANMET, in advancing metallurgical developments in Canada. Originally this was known as the Mines Branch of Canadian Department of Mines and Technical Surveys. There is a comprehensive paper on the development of the iron and steel industry in Canada. There are 3 papers in this section covering the developments in copper, nickel, and the lead - zinc industries in Canada during this fifty years period. There are 2 papers in this section one on magnesium and one on aluminium. Also this section incudes two papers one on gold and the other on uranium. There are five well documented review papers in this section that cover mineral processing, hydrometallurgy, pyrometallurgy, material science, and recycling. This section contains 4 papers. The first is devoted to the development of the F.A.C.T / FactSage System and its impact in Canadian metallurgy. This is a 25-page review of a computer program for calculating thermodynamic properties, phase equilibria, and chemical reactions in complex metallurgical systems developed in the early 1970s by Arthur D. Pelton and Christopher W. Bale, two professors at École Polytechnique in Montreal and proved to be very useful for academic and industrial research. The second, « The Dynamic Evolution of the Metallurgical Engineering Companies » is written by a senior industry manager who discusses the different engineering companies that evaluate projects, supply machinery, and build metallurgical plants. Discussed also are the merging of different companies and the name change. This is a very useful guide for those involved in the consulting business. The third paper is about mining, metals and materials research organizations in Canada. This is also a very useful guide covering federal and provincial research organizations as well as industrial and commercial research centres. Finally, the editors asses the situation and discuss the next 50 years of Canadian mining and metallurgy. There are 3 articles in this section. The first entitled, “Canada’s Pioneer Metallurgists”, which traces the work and biographies of the first metallurgists in Canada and those who passed away and contributed to education and research up to the present. The two other papers are testimonies of two European members who are regular participants at the conferences. Finally, the book ends with Authors Index and short notes on the authors. The book is fully illustrated mostly in color, and printed on high quality paper. The comprehensive references at the end of each chapter are of special importance. The editors have done an excellent job in soliciting the work of these 53 authors and compiling such a huge document that describes the metallurgical industry in Canada. However, not much discussed in the volume are the ferroalloys industry in Canada [ferroniobium, ferrosilicon, and ferromanganese], and ilmenite processing. The book will remain as an essential and brilliant document for Canada’s metallurgical industry for years to come. Back to my Cornish roots! When I was growing up in northern England, Cornwall was a remote and exotic place, a land of smugglers and pirates, with tales of ships wrecked on its wild and rugged rocky coast. I never dreamt that one day I would actually live in this mystical place and be able to show the ‘birthplace of modern mining’ to minerals engineers from around the world. I began writing a biography of my early life in 2009. 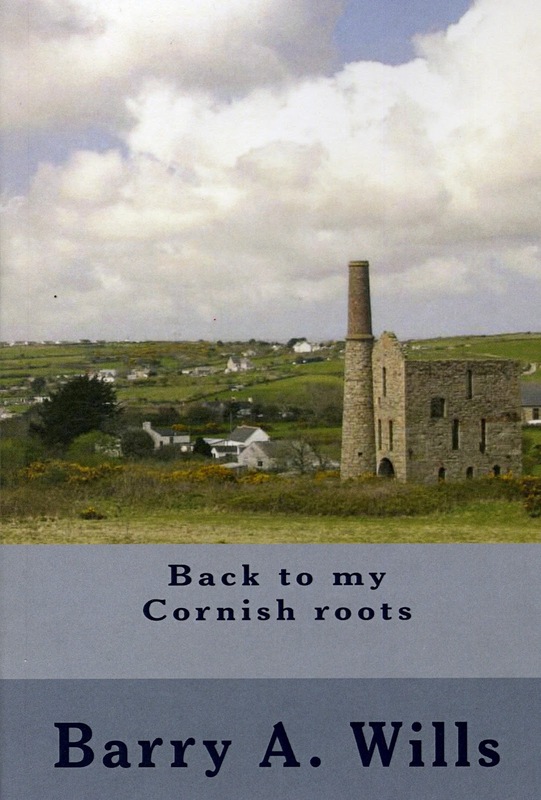 I have always been interested in family history, but know little of how my father's branch of the Wills family found their way to south-east London, so the purpose of the book was to show my descendants how this small branch of the family settled in Cornwall. My mother was a Butterworth, an ancient Lancastrian name of Anglo Saxon origin. The name Wills, however, is thought to have originated in Cornwall. The name has been traced back to the early 11th century, with the first record being found in Saltash on the border with Devon. From the beginning of the 11th century the Wills's were quite wealthy, historians having found that they owned land and estates around various parts of England during that time. The branch of the Wills family that ended up in East London, my father's birthplace, was certainly not wealthy, but now my line has come full circle and is back to its Cornish roots. The story of how we got there has just been published, and, apart from my immediate family, might be of interest to those interested in the social history of working class Lancashire in the mid-20th Century, and to those who have lived and worked on the Zambian Copperbelt. I first heard of the Kell process in June 2010 at the Precious Metals ’10 conference in Falmouth, where Mike Adams of Mutis Liber, Australia, presented a paper on the hydrometallurgical processing of Platreef flotation concentrate. He suggested that the hydrometallurgical flowsheet that could provide a viable process for treating Platreef concentrate is the Kell Process, which broadly comprises the selective leaching of base metals by pressure oxidation, followed by the leaching of PGMs after a roasting pretreatment step. Now this process has been described and evaluated in detail in a paper by Keith Liddell and Mike Adams (see MEI Online for full details). Hopefully we will hear much more of this in November at the next Precious Metals conference. Mike is the MEI consultant to this event and Keith will be presenting a keynote lecture on the processing of South African platinum ores. I recently had lunch with an old colleague of mine who, at the age of 60, has taken up scuba diving. He has a PADI certificate and was enthusing about his dive on the Great Barrier Reef. Both Amanda and I have dived at separate times on The Reef, and in recent years I have dived with Amanda on a coral reef off Thailand, and last November I experienced what is regarded as one of the world’s best reef dives off Madagascar. All these dives were in warm tropical waters, with colourful coral and pretty tropical fish, but to me they all had one thing in common- I found them a little boring! Unlike my friend, and the divers that I spoke to in Madagascar, I could not really get excited about my experiences, and I assume that is because I have done most of my diving off what I believe to be one of the world’s finest locations, the south coast of Cornwall. I have extolled the virtues of Falmouth and Cornwall many times on this blog, the wonderful walks, mining heritage, gardens, restaurants etc, and have never mentioned its rich underwater attractions, which I am sure will be of interest to many of our summer MEI Conference delegates. 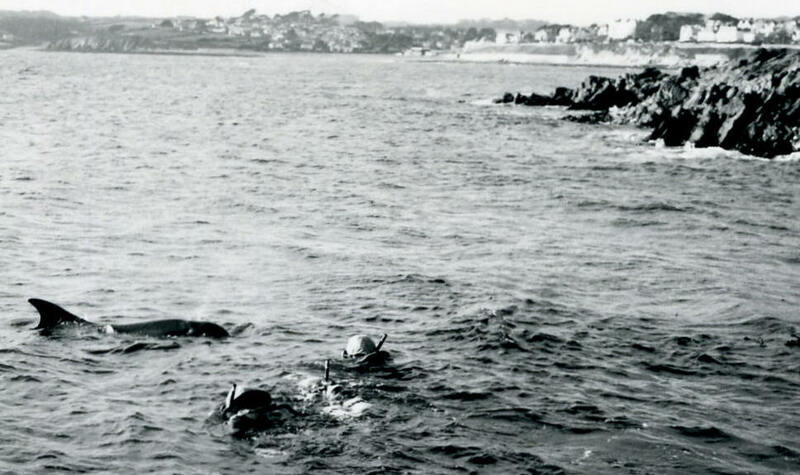 I gave up serious diving in 1979, having logged around 200 dives along the whole of the south Cornwall coast, from Land’s End to the Eddystone Lighthouse near Plymouth. I had qualified as a diver in 1969, with the British Sub-Aqua Club (BSAC), training in freezing reservoirs in the north of England, but most of my dives were from 1975, when I formed the Camborne School of Mines branch of BSAC, and then later became Diving Officer for the Falmouth Branch. Looking back it is strange that not one of my dives was on the rugged North Cornwall coast, partly because to get there would have meant a very long sea journey around Land’s End, but also because the south coast has one very great attraction- a profusion of ship-wrecks. This coast is the entry into the English Channel, always one of the world’s busiest seaways, with treacherous rocks and reefs, and sometimes local inhabitants, inviting the unwary to their doom. Indeed stories of the Cornish ‘wreckers’ are legendary. Daphne du Maurier’s famous book ‘Jamaica Inn’ is a classic tale of a band of wreckers, who set up false lights to lure ships onto rocks so that their contents can be looted. It is indeed a treacherous coast, and Falmouth is one of the best locations from which to explore the reefs and wrecks. 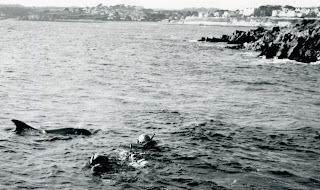 For novice divers there are great shore dives off Pendennis Point, a regular photo-stop on the conference walks. Here you can dive in steep kelp-filled rocky gullies, where wrasse, pollack and mullet swim lazily, as well as the occasional bottle-nosed dolphin. 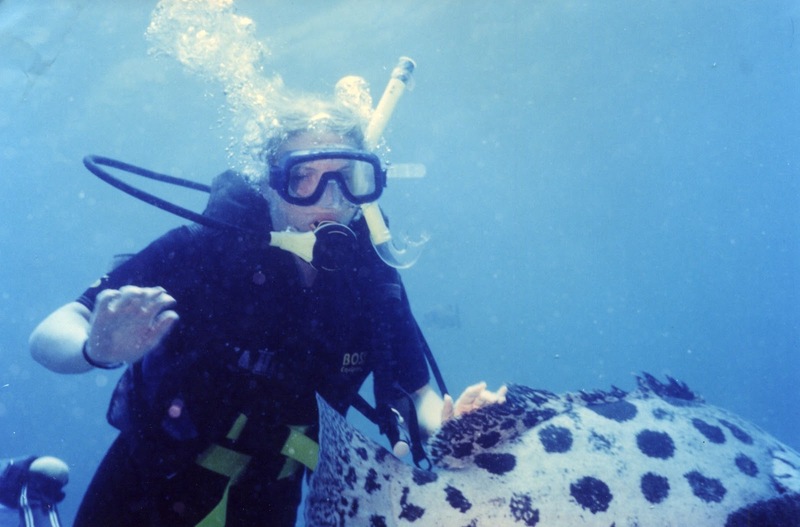 Experienced divers can arrange boat dives into Falmouth Bay, which teems with wrecks. Perhaps the most famed region is the sinister sounding Manacles Reef, in the far west of the bay near the Lizard Peninsula. Here in around 30 metres of water lies Cornwall’s most famous wreck, the ‘Mohegan’ a 7,000 ton passenger liner, which struck the Manacles in October 1898 on only her second voyage to America, claiming 106 lives. With the reputation as Cornwall’s ‘Titanic’, diving on her collapsed superstructure, with the massive boilers looming over you can be an eerie experience. Well over a hundred ships have been wrecked and nearly a thousand people drowned on the Manacles, which stretch almost a mile out to sea, with depths ranging from 12m to 62m. The attraction for divers is not just the wrecks, however, as the deep granite gulleys, covered with anenomes and gorgonia coral, teem with life, including the colourful cuckoo wrasse, pollack and the elusive bass. If you are lucky you may also encounter the massive, but benign, basking sharks which are frequent summer visitors to the coast. 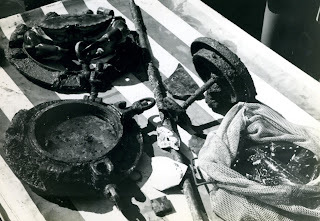 ‘Modern’ divers may be interested in this picture, taken in 1976, at the Manacles. In those fairly early days of amateur diving we wore wetsuits, which provided inadequate protection from the cold, as the bubbles in the neoprene compressed with depth, greatly reducing their insulating properties. 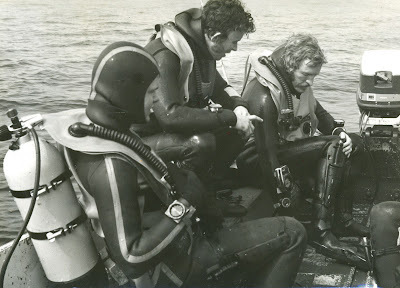 The modern dry suit started to appear in the late ‘70s, but many divers were initially wary of them and continued to wear their wetsuits underneath, as added security. Although we often dived to depths of over 50 metres, compressed air was always used to fill our bottles, allowing us only short dive times and long decompression stops. Nowadays amateur divers use gas mixtures, such as “nitrox”, which contain reduced amounts of nitrogen, reducing the risk of ‘the bends’ and nitrogen narcosis. I am in the right of the picture, and the large device on my right wrist is one of the earliest, and not very reliable, decompression computers, which are today incorporated with the depth gauge in the diver’s wristwatch! If you are attending an MEI Conference in Falmouth, and would like to experience the diving, I would suggest that you contact Cornwall Divers, who can arrange dives for you and rent the necessary equipment. I have received this sad news from Mike Battersby of Maelgwyn Mineral Services, UK, and invite your comments and memories of Rene. Rene Klymowsky sadly passed away on the 4th March at his home in Arnhem, Netherlands. Rene was unbelievably passionate about minerals processing in over 45 years of working in the mining industry. His enthusiasm for his profession will be greatly missed. Rene was still working as hard as ever as Manager – Minerals for Polysius AG at Bockum, Germany at the time of his premature departure. He was born in Germany but moved to Canada shortly after the end of the Second World War. He studied Metallurgical Engineering at McGill University in Montreal obtaining both B.Eng and M.Eng. His early working career saw him in operations for Noranda and Inco before spending 11 years with CANMET. During this time he became Chairman of the Canadian Iron Ore Committee. 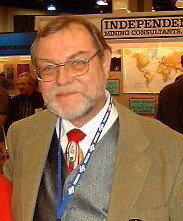 In 1979 he moved to Europe and joined Billiton Research B.V. in Arnhem becoming Principal Scientist. At that time Billiton was the Metals Division of the Shell Company. In 1994 he joined KHD Humboldt Wedag AG in Cologne and then in 2000 Polysius AG in Bockum. At both these companies he specialised in the processing aspects of High Pressure Grinding Rolls. Rene was always at the forefront of mineral processing development. At his time with Billiton he was tasked with evaluating computer simulation programmes and thus became the first commercial user of JKSimMet and an expert in many other programmes such as MetSim and USIM-PAC. He was also briefed by Billiton in the early eighties with evaluating a new technology – High Pressure Grinding. After the sale of Billiton to Gencor Rene then worked with the two principal HPGR suppliers, becoming the eminent expert in the technology. He was largely responsible for their introduction into the minerals industry because he could clearly and succinctly explain and demonstrate on a technical basis to clients how the HPGR’s fitted into their comminution circuit and what the benefits were. Rene was a driven and passionate mineral processor, the typical “workaholic”. A slow starter in the mornings his brain would click into gear in the afternoons and then he would continue well into the night. When his working was reported to be drifting towards midnight his bosses would try and insist he work “regular hours”. He certainly was not “politically correct” by today’s standards and this got him into slight trouble now and again. He also didn’t suffer fools, especially in his profession. As part of an equipment sales team he would regularly cross swords with consultants or company metallurgists who had to give the impression of knowing what they were talking about to their clients or bosses. Invariably, calmly and politely, Rene would point out or demonstrate the errors in their thoughts or calculations. Rene is survived by his wife Susan and children James and Lily; and children Sophie and Christopher in Canada from a previous marriage. Pyrometallurgy in the 21st century. Is it still a contender in the race with hydrometallurgy? Who is the oldest active member of our profession? At the recent SME Meeting in Seattle, the prestigious Arthur F. Taggart Award recipients were MEI Award winner Peter Amelunxen, and FLSmidth’s Dave Meadows. The Arthur F. Taggart Award, established in 1970, is made for the paper or series of closely related papers with at least one common author, which in the opinion of the Awards Committee represents a notable contribution to the science of minerals processing. But I wonder how many of the young people in the audience were aware of who Arthur Taggart was and what he achieved in his lifetime. Arthur Taggart was born in 1884 and in 1919, at the age of 35, became the first person to be awarded a Chair in Mineral Dressing, at the Columbia School of Mines in New York. In 1927 he published his massive tome Handbook of Ore Dressing, which was updated and published again in 1945 as the seminal Handbook of Mineral Dressing. This became the mineral processors bible, and could be found in virtually every mine office around the world. I know when I arrived on the Zambian Copperbelt in 1969 it was the only book on the shelf, and was my first guide to mineral processing. It was part text book, but also a workshop manual for all aspects of operating a mill. The text book elements were published in 1951 as Elements of Ore Dressing. These were just some of the mineral processing books that he published, including texts on crushing, gravity concentration and flotation. This is all that I know of Arthur Taggart. He died in 1959 but I am sure that there are some old processors out there who actually met him, or have stories and anecdotes. If so, it would be great to hear from you. Very powerful and rapid computing has made electronic sorting a process with great future potential. 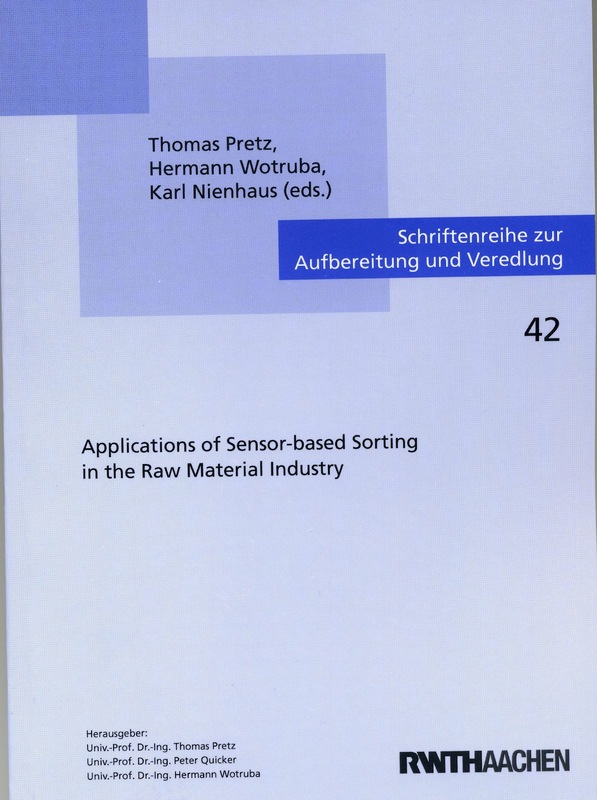 The Institut fur Aufbereitung und Recycling, RWTHAachen University, Germany, runs biennial conferences on this subject, and Applications of Sensor-based Sorting in the Raw Material Industry is a compilation of selected papers from the conferences held in 2008 and 2010. The next conference, Sensor-based Sorting, will be held from April 17-19 of this year. 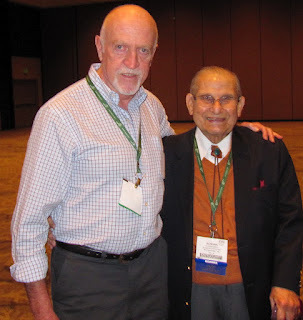 I met up with Roshan Bhappu, President and Founder of Mountain States R&D International, Inc., Arizona, at last week’s SME Meeting in Seattle. I last met him 26 years ago in Falmouth, when he presented a keynote lecture on the impact of strategic minerals on mineral processing developments at the 2-week NATO Advanced Study Institute ‘Mineral Processing at a Crossroads’. At 86-years old, Roshan must surely be one of the oldest active members of our profession, and we reminisced about those two wonderful weeks in Cornwall in 1986. Unfortunately he does not appear in any of the conference photographs. The one below was taken on the memorable boat trip on the River Fal, organised by the now non-existent local company Richard Mozley Ltd.
Barbara and I had a lovely meal last night at Falmouth’s excellent Samphire Restaurant, with Kirsty Hollis and Ted Bearman. Ted and Kirsty had just spent an interesting day at the nearby Camborne School of Mines (CSM). They have been in the UK for two weeks to visit a number of Universities across the country. Researchers at these universities are working on innovative new technologies which may change the face of mineral processing. Ted, of Bear Rock Solutions, in Australia, is a graduate of CSM and received his PhD in rock engineering from Camborne in the 80s. He is well known in the field of comminution, and will be presenting a keynote lecture at next month’s Comminution ’12 in Cape Town. Kirsty is with Newmont Mining Corporation, in Denver, USA, who are sponsoring November’s Precious Metals ’12 in Cape Town. Her role is to look into innovative technology as she and Newmont believe that these will play a key role in the future of both the company and the minerals industry in general.